Before my husband and I got married and moved into a house, we each lived in apartments. I absolutely have to have plants in my life and had several little pots with herbs, flowers, and veggies out on the small balcony of my apartments. 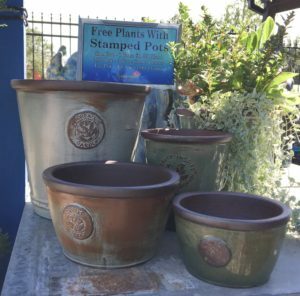 We have these adorable little pots that have stamped sayings on them “Dream Garden” and “Beauty, Inspire, Nourish, Grow” that come in two shapes, three different sizes per shape and a variety of muted colors. The best part is these pots come with free $1.99 nursery stock plants to get you started with your tiny potted garden.